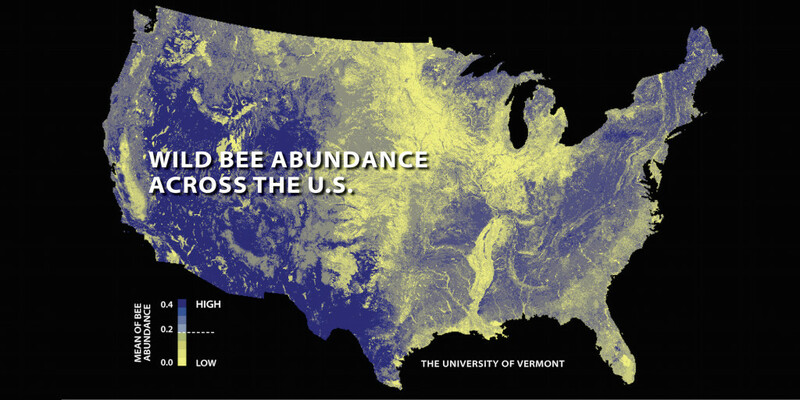 A new national assessment of the status and trends of U.S. wild bees estimates that wild bees declined in 23% of the contiguous U.S. between 2008 and 2013. The team of Project ICP researchers, led by Insu Koh at the University of Vermont, found that the decline was generally associated with conversion of natural habitats to row crops. 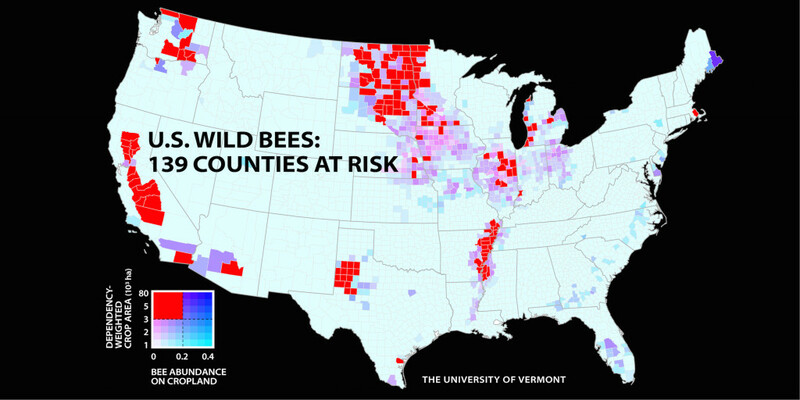 Areas of intense agriculture (e.g., the Midwest Corn Belt and the Central Valley of California) have among the lowest levels of predicted wild bee abundance. The study, published in the December issue of Proceedings of the National Academy of Sciences, shows that 39% of the US croplands that depend on pollinators—from apple orchards to pumpkin patches—face a mismatch between rising demand for pollination and a falling supply of wild bees. As the acreage of pollinator-dependent crops expands, the concurrent loss of natural habitat leads to lower abundance of the wild bees needed to pollinate these crops. To maintain stability in pollinators, crop pollination, and yields of these crops, the authors suggest that farmers may need to maintain or enhance habitats for wild bees on and around their farms or invest more heavily in managed pollinators. To learn more, read the coverage of this paper from the University of Vermont. To read about the policy implications of this study for wild bees and crop pollination, click the link to our post here. A new analysis in PNAS finds that 139 U.S. counties are at risk of a “pollinator mismatch” between the abundance of wild pollinators and the acreage of pollinator-dependent fruit, nut, and vegetable crops.